So you want to buy a professional video editing software with your limited budget, less than $100 in 2018. You’re at the right place. We’ve listed out top 10 professional video editing software you can buy now with the price range from $20 – $100. Many people mistakenly believe that professional video editing software has to be extremely expensive. They did not know that for only less than $100, they are able to buy not only professional video editing software but also full of features to edit videos for many purposes. In 2017, I created a list of professional video editing software to buy at a very low cost. You can review it here. 2018 is approaching very close. This is a good time to review my list and update it. In today’s article, I will suggest to you the best professional video editing software that cost less than $100. These programs can meet all your needs in making films, promotion videos, music video clips or whatever. I can’t promise for sure that after using this software, your video will look like Hollywood movies like Avenger, Avatar or become a music video that attracts billions of views like Despacito of Luis Fonsi. However, I am sure that these programs will provide all the necessary tools for you to create the same videos. PowerDirector16 offers a unique combination of high-end performance and advanced editing features. It’s remarkably easy to use, making video editing accessible to creators of all skill levels, and a huge selection of customizable design tools, including unique alpha transitions, animated titles, particles and PiP objects, provide the freedom to explore creativity and reflect it in unique video creations. PowerDirector now supports complete end-to-end 360-degree video editing, opening up a whole new world of possibilities. Import equirectangular footage, create a 360° project, edit with a full range of design tools, then export in 360° format. Add titles and effects for viewers to discover as they explore your creation. Experiment with transitions, animated objects and more! The unique View Designer enables you to use 360° video footage in standard video projects: it’s like you’ve filmed a scene with multiple cameras from multiple angles. Busy but intuitive user interface. Edit video in 4K and 360 degree. Tons of filters, transitions and text title. High speed video rendering speed. Continue to update and upgrade yearly. Filmora video editor is one of the most simple to use, professional video editing software you should buy in 2018. The price $39.99 per license is for personal user only. 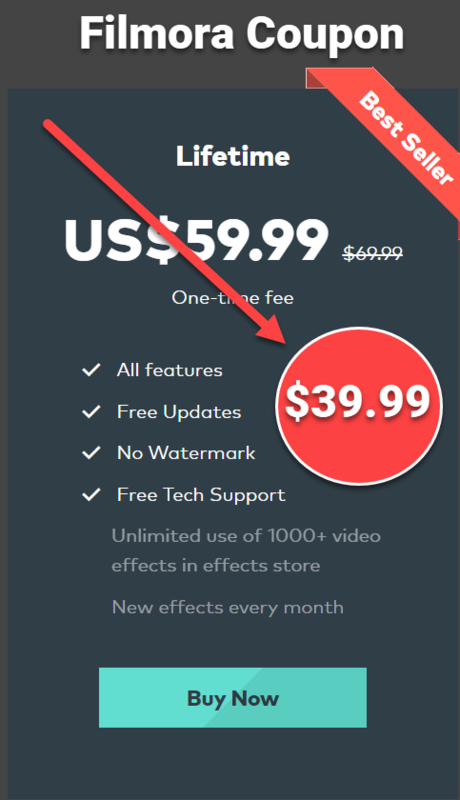 If you want to make video for business, it is increased to $59.99 which is still a great bargain for such professional software like Filmora. >>Read more about Filmora. Modern & Easy to Use: Filmora’s delightfully intuitive design makes it easy for anyone to become a great video editor. Filters and Overlays Transform your video with a variety of filters and graphic overlays. Text and Titles Communicate using a huge selection of titles, openers, and lower thirds. Transitions Combine multiple videos and images seamlessly. Music Choose the perfect royalty free song from a library of music made by real. 4K Editing Support Edit and export videos at resolutions of up to 4K. GIF Support Import, edit, and export .GIF files. Noise Removal Remove unwanted background noise easily. Reverse Flip your clips and play them backwards. Social Import Import photos and clips directly from Facebook or other social media platforms. Precision Speed Control Make your clips up to 100 times faster or slower. Perfect for time lapses. Frame by Frame Preview Jump through your audio and video tracks one frame at a time for precise editing. Color Tuning Adjust the white balance and dynamic range of your clips. Pan and Zoom Add panning and zooming movements to still footage. 1:1 & Portrait Support Edit videos with aspect ratios of 1:1 (square) or 9:16 (portrait) with no black frame. More Music & Text Layers Add up to 5 text tracks and 10 music tracks to your timeline. Camera Shake Choose from a variety of camera shake effects and apply them easily. AVS video editor is a simple to use with all tools you need to edit video such as: Trim, cut, split, merge, rotate and mix videos with AVS Video Editor. Select between 300 innovative video effects and transitions. Insert menus, audio, text comments and subtitles. Stabilize video camera shaky recordings. Edit Your Video with Fantasy: Trim, cut, split, merge, rotate and mix videos with AVS Video Editor. Select between 300 innovative video effects and transitions. Insert menus, audio, text comments and subtitles. Stabilize video camera shaky recordings. Speed Up HD-Videos Editing Edit AVI HD, WMV HD, TOD, AVCHD, MOD, MTS/M2TS, etc. with AVS Video Editor. Due to the integrated video cache technology, HD-video editing becomes faster. Record Your Video Transfer video from DV/HDV cameras, webcams or VHS cameras and save video on hard drive or burn DVD discs. Record media files from your PC screen and create video guides, training videos or demos. Make Stunning Slideshows Capture memorable events and turn them into amazing slideshows. Import images, add your voice or favourite audio tracks, captions and impressive video effects and transitions. Create Blu-ray Videos Open and edit your Blu-ray videos with AVS Video Editor. Apply effects and add specially designed menus. Add audio, video and images to your videos. Choose between numerous themes and stylish menu templates. Share Your Video Tell your story in different ways. Save the newly-made video in the desired format on your computer, burn a DVD/Blu-ray disc, adjust video for your iOS and Android devices or publish your creative work in social networks. Multilingual Support AVS Video Editor interface is available in English, French, German, Spanish, Italian, Japanese, Dutch, Polish, Danish and Russian. Learn more at AVS4YOU here! Movavi video editor is a professional software that can help you transform a raw clip, footage into polished, high quality videos. It is an excellent software with great price – starting at $39,95. If you are looking for a simple to use, easy to learn video editing software with powerful features and tons of effects, try Movavi Video editor. Built-in media Use video clips, backgrounds, music, and sound from Video Editor library. Video stabilization Remove motion distortion without affecting overall video quality. Picture in picture Combine multiple videos on one screen. Audio editing tools Adjust audio frequency, normalize audio, remove noise, apply special effects. Webcam capture Record video from your web camera. Beat detection Automatically detect audio rhythm to sync with the tempo of your project. Audio recording Record your own voiceover via microphone, capture sound from musical instruments. Fast processing Edit and export videos without delay, thanks to support for Intel®hardware acceleration. Voilabits VideoEditor is a professional, low cost video editing software for Mac you can try in 2018. It is a handy new tool that lets you edit videos easily and quickly! Cut and merge various clips, apply special effects, trim, crop, rotate video and much more. Convert for any popular player device and share anywhere. Personalize and spice videos with crop, trim, music, filter, webcam, ect. Editing video is not a difficult task, especially when you have a simple to use and professional programs like the above mentioned software. I hope you get what you need in this article. I will keep updating this article to fulfill the list with 5 more programs in early 2018. If you have any suggestion, share with me in the comment area. Don’t forget to follow us to receive more valuable post notifications in the future. If you want to find a free video editor, take a look at this article. What Is A Screencast? What’s it for?